Romanian numismatics knows lots of monetary patterns, many of them being presented inside monograph Monede şi bancnote româneşti by George Buzdugan, Octavian Luchian and Constantin Oprescu (1977). This piece that could have been the first silver modern Romanian 1 leu coin appears at position 196. The pattern was struck at the Heaton Mint in Birmingham (and not at Royal Mint in London, as claimed by MBR) and portrays the effigy of young reigning prince Carol I with whiskers and side whiskers, just like on the famous 20 lei of 1868 and on four anniversary coins of the 1906 series. Click here to see the golden 100 lei of 1906 with the same young countenance. On all other coins of Carol, the prince and then king appears with regular beard and whiskers. 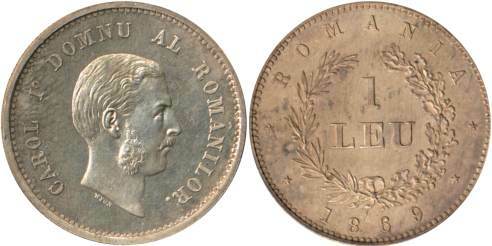 The pattern pictures above are present on Romanian coins through the kind permission of Mr. J. M..
"According to my information, the 1869 essays were not struck at the Royal Mint in London, but at the private Heaton Mint in Birmingham. I bought these essays at an auction of duplicates from their collection (actually two specimen of each were sold, coming from a display that hung in their offices; one of the specimen has toning on the obverse, and the other on the reverse). The reason why a private Mint was used is probably the following: the Ottoman government agreed that Romania could strike coins of its own, provided a sign of submission to the Ottoman government was present; this is obviously not the case with these essays; the Ottoman government intervened with the French and Belgian government (and perhaps also the British government) in order to prevent that their official Mints would strike these coins; such an intervention had no effect on the Heaton Mint, being a private company; for some reason or another, however, this type never became a real circulating coin."